Home / #Russia / #TrueNews / #UK / Mistery / Russia / Spy / Spy Story / True News / UK / Mistery & Spy Story in UK :Who has sprayed with deadly poison Sergei Skripal ,66, former colonel of Russian army ? Mistery & Spy Story in UK :Who has sprayed with deadly poison Sergei Skripal ,66, former colonel of Russian army ? Who has sprayed with deadly poison Sergei Skripal,66,former colonel of Russian army ? Ex-spy Sergei Skripal may have been ambushed by attackers who sprayed him with poison in the street. Investigators suspect the Russian army colonel collapsed so quickly because he inhaled the deadly chemical. One line of inquiry is that his daughter Yulia is 'collateral damage', coming into contact with the substance as she attempted to help him. Authorities are also hunting a blonde woman with a red handbag who was captured on CCTV 20 minutes before Mr Skripal and his daughter were found collapsed on a bench, the Sun reports. It was initially thought the footage showed Yulia, but a witness who saw her with her father hours before they collapsed insisted she had reddish brown, not blonde hair, according to the newspaper. Another line of inquiry investigators are looking into is the possibility Mr Skripal's drink was spiked at a pub he and is daughter visited shortly before they collapsed. Last night, both were fighting for their lives in hospital and remained in a critical condition. The incident is being treated as an assassination attempt linked to the Kremlin, Whitehall sources confirmed to The Times. But other theories, including that a rival faction may want to frame Russia for the incident - have yet to be ruled out. The deaths of Mr Skripal's wife from cancer in 2012 and his son's death in St. Petersburg last year will be looked into as part of the investigation, according to The Times. 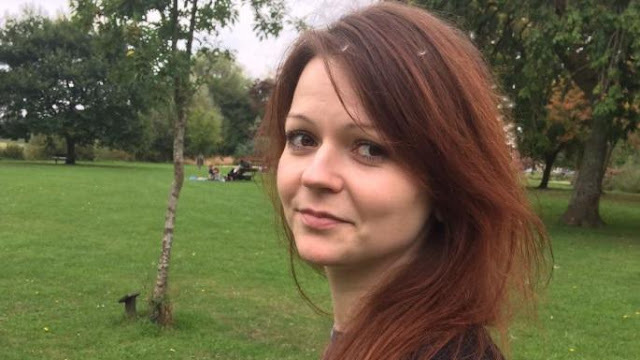 Police in Salisbury have widened their cordon to the site where Mr Skripal, 66, and his daughter, 33, were taken ill, expanding it beyond the restaurant and pub which were initially closed off, while forensic teams continued to examine the scene. Firefighters in Hazmat suits were last night sent to an ambulance base and were carrying out an inspection of the Zizzi restaurant in Salisbury town centre, with the restaurant closed since Monday morning. It is not clear when the couple were confronted, having left a branch of Italian restaurant chain Zizzi between 2pm and 3pm and being found on a bench overlooking the Avon shorly after 4pm. They had also visited a pub called The Mill. FREE ENTRANCE 24 H a DAY ! 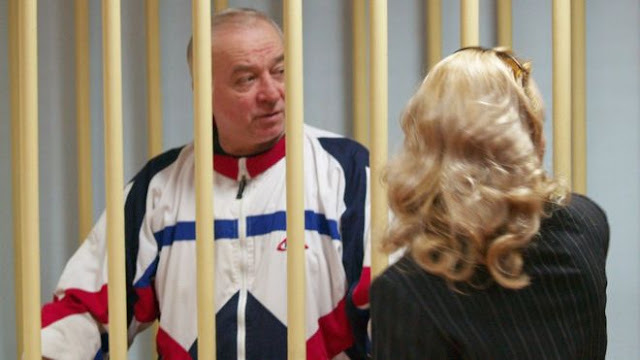 Several bystanders went to their aid as Mr Skripal fell into a catatonic state and Yulia appeared to suffer a fit on the ground. Up to ten emergency service workers were also assessed by medical staff after treating the Skripals, of whom one remained in hospital last night. Counter-terror detectives from Scotland Yard have assumed control of the probe, which has taken on political and international significance, and led to a meeting of the National Security Council. Some emergency workers had complained of suffering itchy eyes and difficulty breathing, suggesting some of the mystery poison may have remained in the air, while their colleagues put on full biohazard suits and respirators. Tests on the substance involved are being carried out at the defence research centre at Porton Down. Two police officers who were among the first to come into contact with Mr Skripal and his daughter were also admitted to hospital after suffering itchy eyes, rashes and wheezing on Sunday. Up to 10 other people suffered symptoms including vomiting. Toxicologists will examine samples of blood, urine and tissue taken from the victims at Salisbury District Hospital.